Shunbun, the Vernal Equinox, has finally arrived. We have been having couple of pleasant sunny days around Tokyo which definitely nurtured buds of cherry blossoms. On 18th, the first bloom of ‘Somei-Yoshino’, the Yoshino cherryW, blossom was confirmed in Sukumo, KochiW by Local Meteorological Observatory of Kochi prefectureW officially. There are some species of cherry trees which bloom earlier as Kawazu cherry blossoms of Kawazu, ShizuokaW in February but when Japanese speak of cherry blossoms, the cherry blossom is mainly Yoshino cherry trees’. How longing for the bloom of Yoshino cherries to the Japanese could be proven easily by the word ‘Sakura zensen’, meaning the cherry-blossom front, or by the forecast of cherry blossoms’ flowering time reported in several medias often at this time of the year. The first Yoshino cherry blossom bloom of 2014 at Sukumo, Kouchi prefecture. Photo from Japan Meteorological Agency ofifcial site. By reading Wikipedia’s Cherry blossomW article, you could find out roughly on why the Japanese have special affection on this tree blossom. There, you will find both positive and negative symbolic means of cherry trees to the Japanese which could be misunderstood without presupposing the basis of Japanese spiritual nature originated in the Yin and yangW philosophy of ancient China, developed independently in Japan. However, most Japanese adore this time of the season and the cherry blossoms simply because of their profoundly memorable events they have experienced. New Year’s start, like the NowruzW, the Iranian or Persian New Year in the Middle East, Japan has the substantial new year start as the fiscal year ends at this time of the year. Graduation, job relocation, retiring, new school entrance and newly-joining happen to many in the background of cherry blossoms in bloom which are left as unforgettable parting and encountering memories. 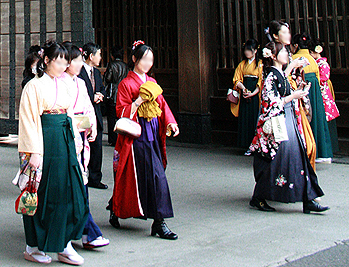 College students attending graduation ceremony in kimono and hakamaW. 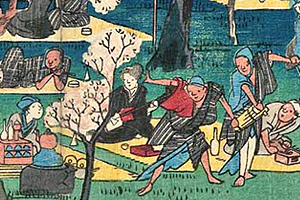 The modern love towards ‘Sakura’, the cherry blossom, is reflected in many fields still today. J-pop music, fashion, food, Manga and Anime associated with cherry blossoms come into vogue especially at this time of the year. Many girls born at this time of the year is named ‘Sakura’ or with names using the Chinese character for ‘Sakura’. ‘Hana-mi’, simply a Japanese noun meaning blossom viewing but the blossom is emphasized on cherry blossoms, should be taking places in many parks with cherry trees, day and night, having picnic-sort of gatherings with families, friends or colleagues, though quite a lot is only keen on eating and drinking, not looking at the blossoms. There is a very famous old saying in Japanese to these sort of people, ‘Hana yori dango’, meaning dumplings than flowers! Hana-mi in Edo period at Gotenyama, now in Shinagawa-ku, Tokyo. 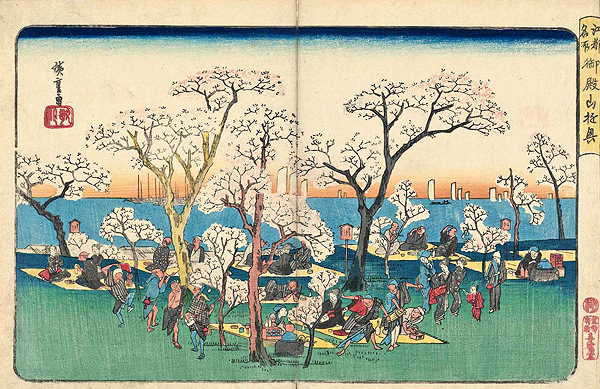 Drawn by Hiroshige Utagawa. 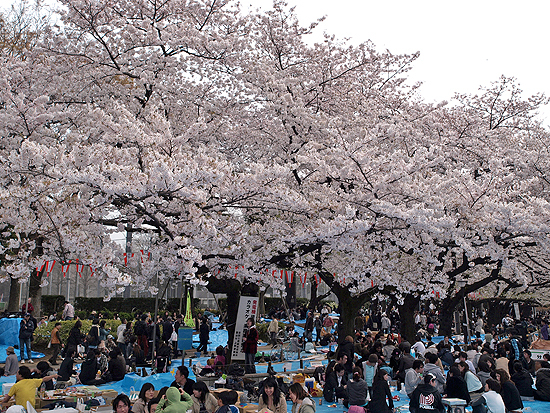 “Hana-yori-dango” people enjoying themselves more dancing, drinking and eating than flower viewing! Noble Japanese dressed in western outfit in Meiji period in Asuka-yama, now known as Asukayama Park in Kita-ku, Tokyo, still one of the major spots for Hana-mi. Drawn by Chikanobu Yoshiyu. Hana-mi nowadays. More of a friend-gatherings than viewing flowers. 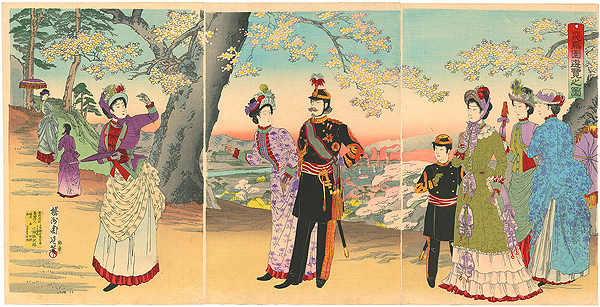 21st March, this year in 2014, is a national holiday in Japan called Vernal Equinox day. The purport of this day stated in the Japanese National Holidays Law is for us to praise the nature and love the creature. It will be three consecutive days off this coming weekend in Japan when many would be expected to go out for their excursion into nature. It is still a bit early for the ‘Hana-mi’ but if you are in Japan now and are planning to go outside the cities into countryside, beware of the unexpected traffic jams. ‘Suzume’, the Eurasian Tree SparrowW, is the most common and familiar bird we see everywhere in Japan. As it is a typical synanthropeW, there are several fables related on this tiny bird as well as poems written and Japanese paintings on it in Japan. It is interesting that Suzume, the subdued brown colour bird, as it may not seem artistic by its colour and style, has been keeping interest of the past Japanese artists. The spirit of Wabi-sabiW, the aesthetic sense of the Japanese which emphasizes the quiet simplicity and subdued refinement are often aroused when there are plain motifs in splendid arts, and of course, there should be such sort of spirit underneath those arts but taking and looking at them easily, we think they are simply cute and loving, just like the Easter bunnies or chicks at this time of the year in occidental Christian countries. As Suzume is not a migratory bird which can been seen throughout the year, it is hard to tell the season by only expressing their given proper noun but by adding certain adjective like ‘Fukura-suzume’, meaning ruffled Suzume pointing Suzume ruffling to avoid cold in mid winter, or by describing their action has been some seasonal word from the past in Japan. Suzume was used a lot because it was a common bird that could be seen everywhere for the Japanese and has been a motif which almost everyone could easily imagine. Because of Suzume’s such characteristic, it should have been also a motif or a symbol for most without fame or wealth which could superimpose themselves on. Suzume, as a creature to the Japanese, having both faces, of a useful bird and a harmful bird regarding rice farming, may have also influenced on superimposing themselves on…. 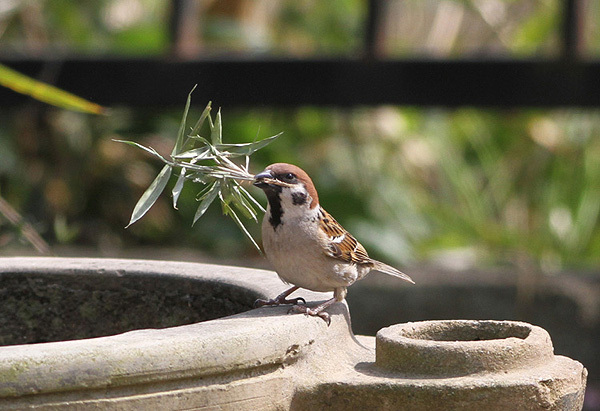 ‘Suzume’, Eurasian Tree Sparrow, holding bamboo grass for it’s nest. Photo from ‘Mori-no tousan Kachofugetsu‘. As described above, this time of the year in Japan is where departing and new life starts. Many who are expecting their new start in new places would be busy preparing, on the other hand, for those who doesn’t would be helping those busy or would be watching over them. Today’s season phrase may have been through the eyes of those who are watching over someone close leaving, like parents watching over their children getting packed to leave their home, starting their new life. 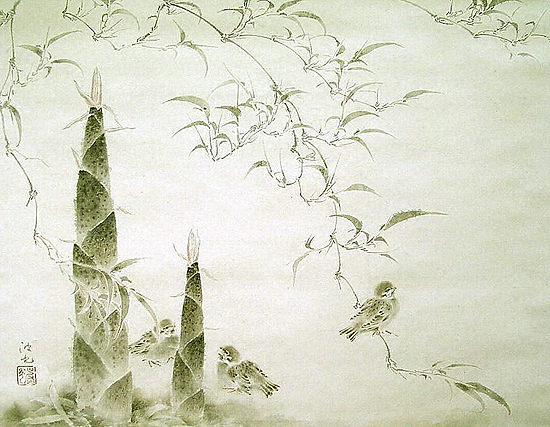 Classical Japanese paintings of bamboo shoots and Suzume. Drawn by Hako Irie. The following word after ‘Suzume’ is a word we have come up to several times before, ‘hajimete’, meaning, for the first time. Therefore, Suzume is into action, the next following verb ‘sukuu’, for the first time. ‘Sukuu’ is a verb meaning, to build a nest. So, the whole meaning of the phrase would be, Suzume start to build their nests for the first time, which, not only to the wild creatures but can be a scene to those who would superimpose their lives, starting their new life at this time of the year in Japan. Whenever writing these articles, we find out many things for the first time when looking up at many resources. Until today, we thought we would have to post the binominal name when introducing today’s seasonal item in English but no. There is a decent English name to this plant which utters the feature of this plant looking like a horse tail! The Japanese name given to this plant is called ‘Sugina’ which literally means cedar vegetable which also describes well of its figure. 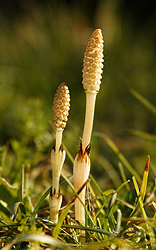 Tsukushi, field horsetail buds, blooming on the ditch. Sugina was passed down as a herbal medicine, known for its diuretic effect and has been thought to be good on dropsy. Nowadays, it is said to be effective for those who suffer from hay fever though its’ effect is not publically proven, a folk medicine. 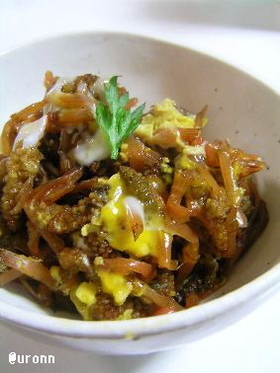 Tsukushi, that used to be spring vegetable which can be picked in wild. Tusukushi is a discrete name given to the buds of Sugina in Japanese. There is no record on why this certain name was given especially to the bud, maybe because it was a bud that attracted people’s attention where there were no other plants on early spring ground or that people were aware of Sugina as they were important medicine when there was only few. The kanjiW for Tsukushi / 土筆 is written with two kanji meaning ‘the soil’ and ‘a brush’, a phonetic symbol which cannot be read as ‘Tsukushi’ if you don’t know how to read it but expresses its feature. 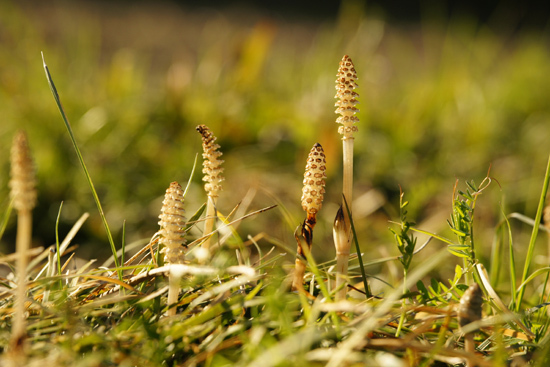 Tsukushi can be easily found if you look carefully on the ditches of the field as its colour is soil-like brown. 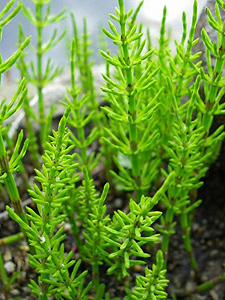 Tsukushi can be eaten and it surely has been one of the edible wild plant that represents the spring arrival in the past. You cannot buy Tsukushi in supermarkets as they aren’t distributed in the market but if you ever have a chance trying the private cuisine in the countryside or find some in the ditches of the countryside, it will be interesting for you to try. You need to take off the scales of the stalk first and boil them to get rid of the harshness, until tender (about 3 to 5 minutes). Next, put into cool water for about 30 minutes to get rid of the harshness completely after boiling. Wring water-soaked Tsukushi and cut into the easy-to-eat size. Put Tsukushi, DashiW, sugar and soy sauce in a pan, cook for about 15 to 20 minutes with a lid on. Beat eggs and pour the eggs in the pan, turn off the fire and put the lid on again. Leave it until the egg turns soft-boil, there you have the most generic menu of Tsukushi in Japan, ‘Tsukushi no tamago toji’, Egg-bound Tsukushi! Typical spring dish in the countryside of Japan.